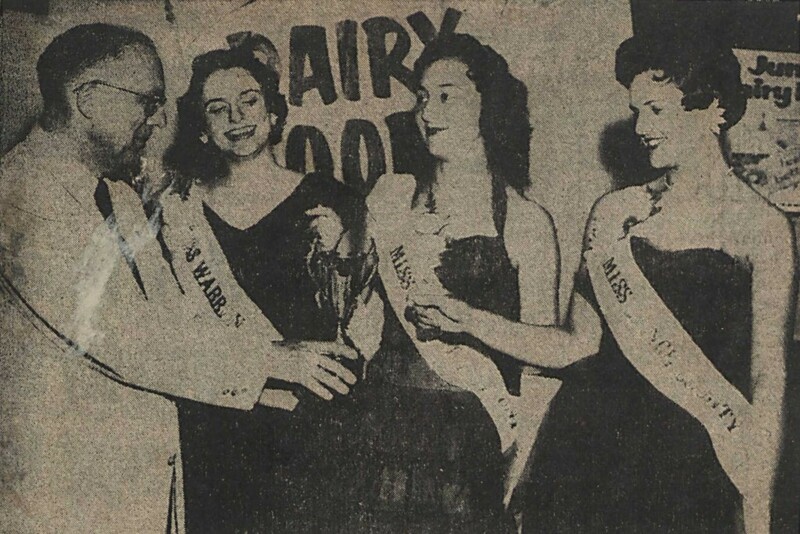 Dairy Princesses for Warren, Granville, and Vance counties are crowned in 1956. Now available on DigitalNC are seven scrapbooks from Granville County Public Library. These volumes belong to the larger Hays Collection, a large collection of Oxford and Granville County scrapbooks compiled by local historian Francis B. Hays over the span of more than 75 years. DigitalNC now has digitally published through volume 43 of the Francis B. Hays Collection. The items are grouped by topic: Oxford and Granville Men and Women, Granville County Family Histories, Granville County Marriages Oxford History, By or About Frances B. Hays, Granville County Histories, and Granville County Schools. Photograph of Mystery Farm No. 43, which belonged to the Currin family. The two topics most recently updated are Granville County History and Granville County Schools. Granville County History: The fifth and final volume of general county history features a series of clippings from the local newspaper’s Mystery Farm contest. 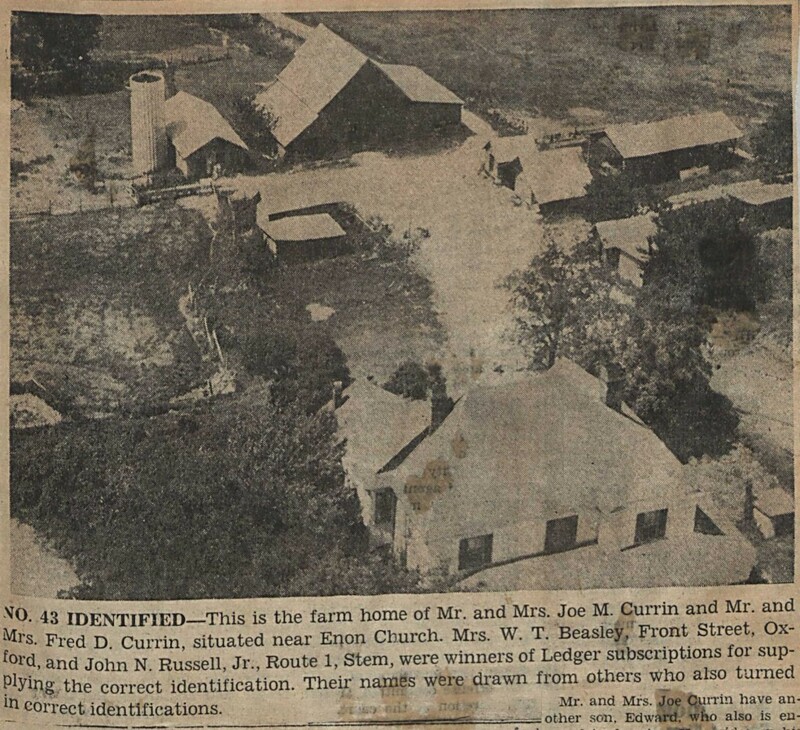 The newspaper would post aerial photographs of unidentified local farms, and members of the community would write in and give information about the farm. The newspaper would then run a story identifying the farm and the contest winner. For more mystery farms, see the volume starting at page 144. 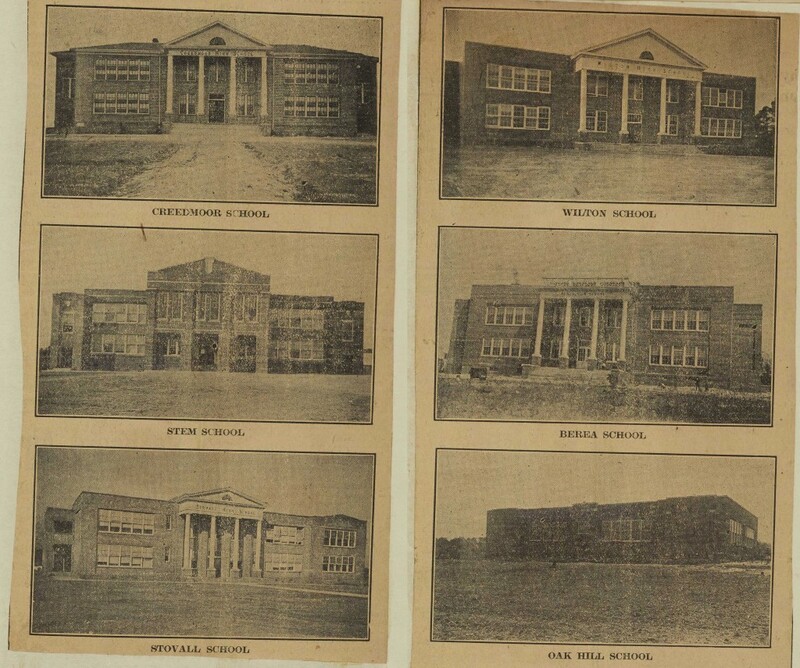 Photographs from 1925 of the newly built Creedmoor School, Stem School, Stovall School, Wilton School, Berea School, and Oak Hill School in Granville County. and photographs, as well as occasional memorabilia like the 1954 commencement program from Oxford High School. The latter pages of Volume VI cover Granville County church history, especially of articles and pamplets from numerous Baptist churches in the region. It also includes the address by William A. Devin at the Grassy Creek Baptist Church Bi-Centennial Celebration in 1954. For more information about the Francis B. Hays Collection or to browse by scrapbook topic, click here. 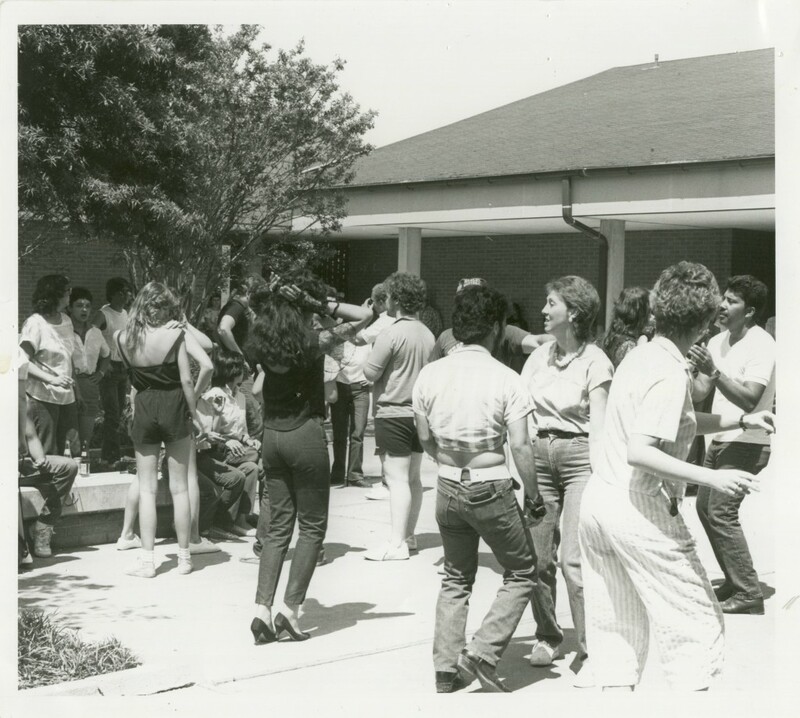 Robeson Community College Photographs and Memorabilia Now Available! More Robeson Community College material has been digitized and made available online! This includes additions to the photo collections Robeson Community College Students and Robeson Community College Faculty and Staff, as well as the addition of the collection Robeson Community College Today and a selection of individual photographs. 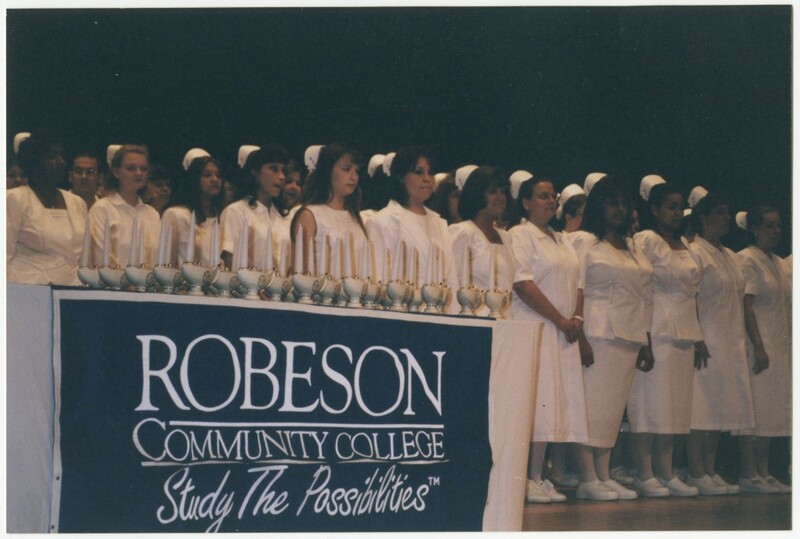 In addition to these photographs, numerous programs from past Robeson Community College events are now available. This includes programs from several years of Robeson Community College Retirement Receptions and Robeson Community College Employee Appreciation Banquets. 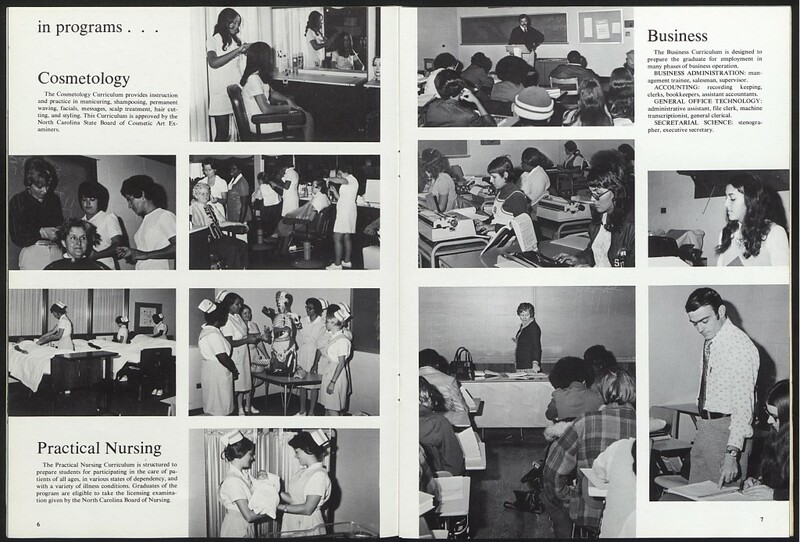 We have also digitized more campus publications from Robeson Community College, including Commencement Exercises from the 1970s and 1980s and Pinning Ceremony Programs for the Nursing School. Pages 6 and 7 from the 1975 issue of Directions, the yearbook for Robeson Technical Institute. To explore more from Robeson Community College, click here. 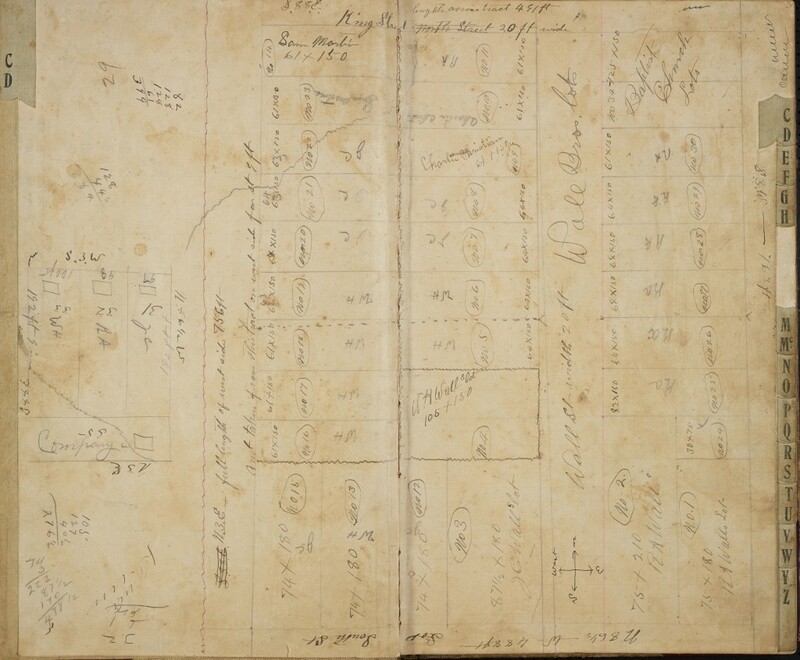 Two ledgers and one document of a financial transaction from the Stanly County Museum have now been added to the North Carolina Memory collection of DigitalNC. The first ledger shows transactions kept by William Henry Wall (1888-1967), a respected Stanly County resident and son of former slaves. Of especial interest is a sketched out plan on pages 5-6 for Kingville, an African-American community in Albemarle. A number of the names in this ledger also appear in the papers of the Dr. Francis Joseph Kron Collection. The second ledger comes from the Stanly County Home, and it documents the inmates at the home between the years 1919 to 1955, including the inmate’s name, reason for being admitted into the home, and dates of release or death, in which case cause of death was recorded. The document mentioned above is also associated with the Home; it is an account of the costs of some lumber that were sent to the home for construction on the porch. You can view all of Stanly County Museum’s materials on DigitalNC. New materials have been added to the Dr. Francis Joseph Kron Collection, a rich manuscript collection from the Stanly County Museum. Most of the documents pertain to former slaves of Dr. Kron’s daughters, although he himself is mentioned in a few of them. One of the batches of documents contains tax record receipts. Many of these receipts show the amount of state, county, and poll taxes paid. The other batches, one covering the years between 1855 and 1889, the other from the years 1869 to 1905, are primarily financial documents, although there are some letters of correspondence between family members. There are a number of interesting documents in these collections that lay out the terms of sharecropping agreements. Detail of signatures on a sharecropping contract between James Kron & Lewis Brutton. Dr. Francis Joseph Kron was a resident of Montgomery County, and he owned sizable amounts of land both there and in Stanly County. He had a variety of interests and in the course of his life he was a teacher, physician, plantation owner, and horticulturalist. For more information about Dr. Kron, visit the Stanly County Museum’s website. There are more papers from Dr. Kron available on DigitalNC’s website, as well as in the Southern Historical Collection in Wilson Library at UNC-Chapel Hill. 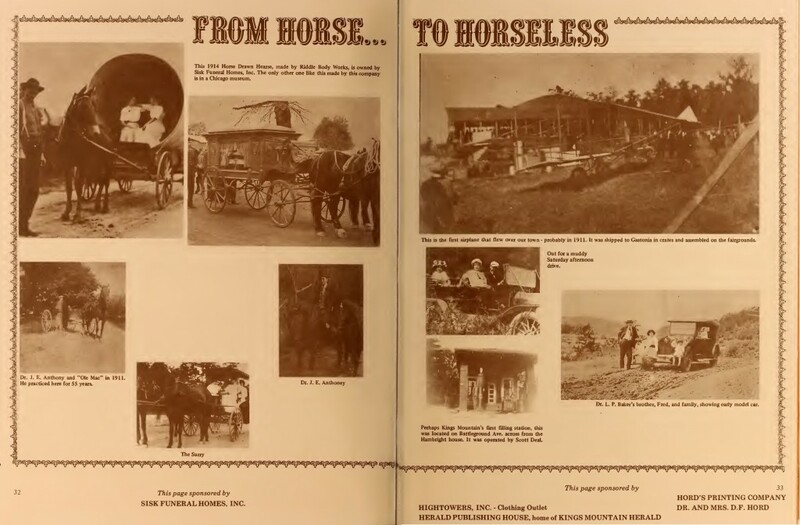 “From Horse to Horseless,” pages 32 and 33 in History and program commemorating the centennial of Kings Mountain 1874-1974. Recently, we digitized the 1974 Centennial history and program for Kings Mountain, North Carolina, from new contributing institution Mauney Memorial Library. The booklet includes numerous photographs and a detailed history of the town, with each page sponsored by a different local business. Contents also include various programs for events relevant to the centennial celebration. 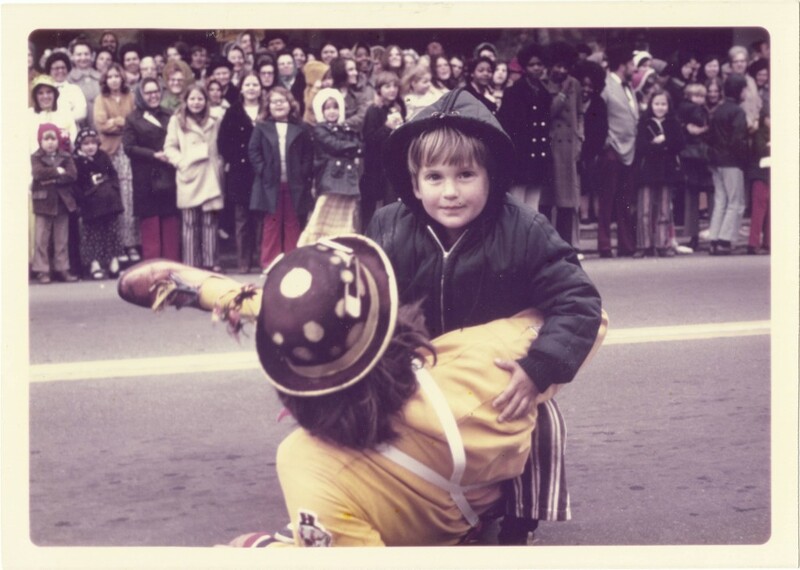 This addition to DigitalNC.org is just one of many digitized objects available online related to the celebration of a town or organization’s centennial celebration. Page 94 and page 96 from the Albemarle, Stanly County Centennial. Among these materials is the Albemarle, Stanly County Centennial from 1957. The Bridge from Yesterday–Into Tomorrow is an Albemarle Centennial booklet published by the Albemarle-Stanly County Historic Preservation Commission. The booklet includes poetry, personal accounts from locals, and photographs of Albemarle citizens. 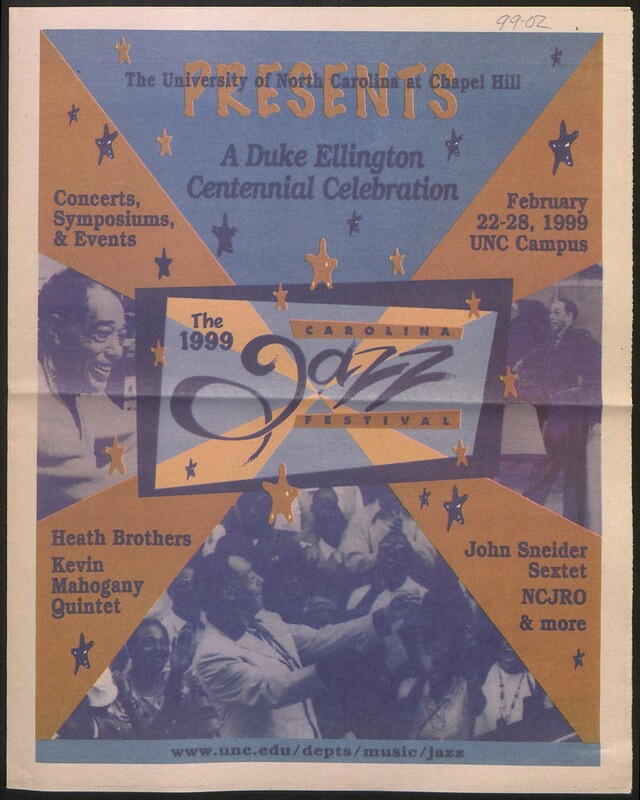 A more recent publication is A Duke Ellington Centennial Celebration from 1999. A Duke Ellington Centennial Celebration is a program generated by “Beyond Category: A Symposium on the Life, Works, and Orchestra of Duke Ellington,” a project made possible via the North Carolina Humanities Council. The symposium occurred on February 22-28, 1999, at the University of North Carolina at Chapel Hill. It included lectures on Jazz and many concerts performed by local and recognized musicians, including Kevin Mahogany and The Heath Brothers. 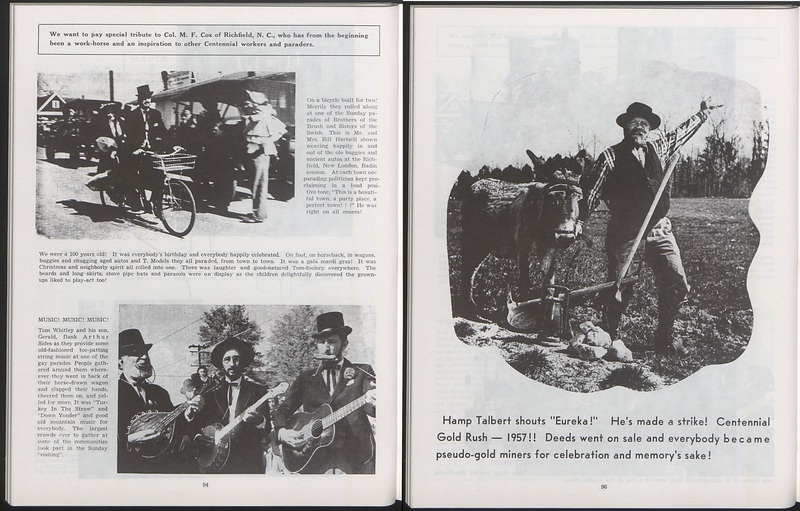 Another selection is the August 1987 East Bend Centennial Scrapbook, which commemorates the 100 year anniversary of the town of East Bend, which was founded March 7, 1887. Click here to browse a selection of North Carolina Memory centennial materials. In addition to North Carolina Memory, DigitalNC’s Images of North Carolina also contains photographs depicting Centennial Celebrations. 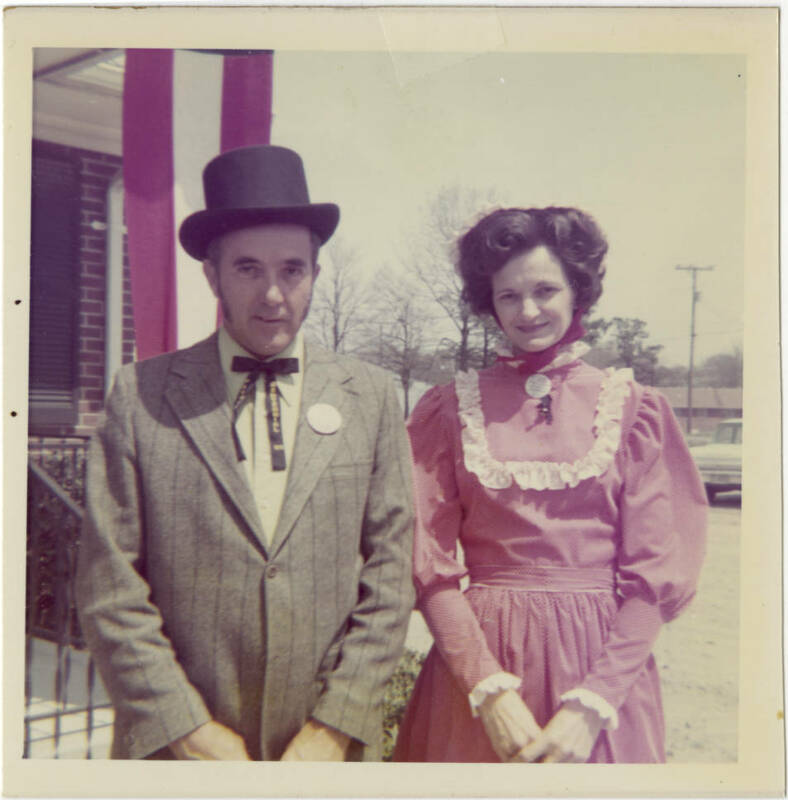 The 1972 Farmville Centennial Celebration, for instance, has over 150 photographs documenting the centennial parade and the Farmville residents posing for portraits in period costume. Accompanying the photographs is Farmville’s 100th Anniversary book, which contains a detailed history of the town’s founding as well as accounts of notable residents, organizations, and events. You may browse other images from North Carolina centennial celebrations here. This issue announces the first Founders Day, held in honor of UNC Asheville’s 70th anniversary, October 1997. Bulldog fans can now search UNC-Asheville’s student newspapers through the 1990s and up to 2003, thanks to the school’s Ramsey Library. Joining papers dating back to 1935, these recently added issues are all entitled The Blue Banner or The Banner. They document the popular rise of the Internet, and include the events of September 11, 2001. 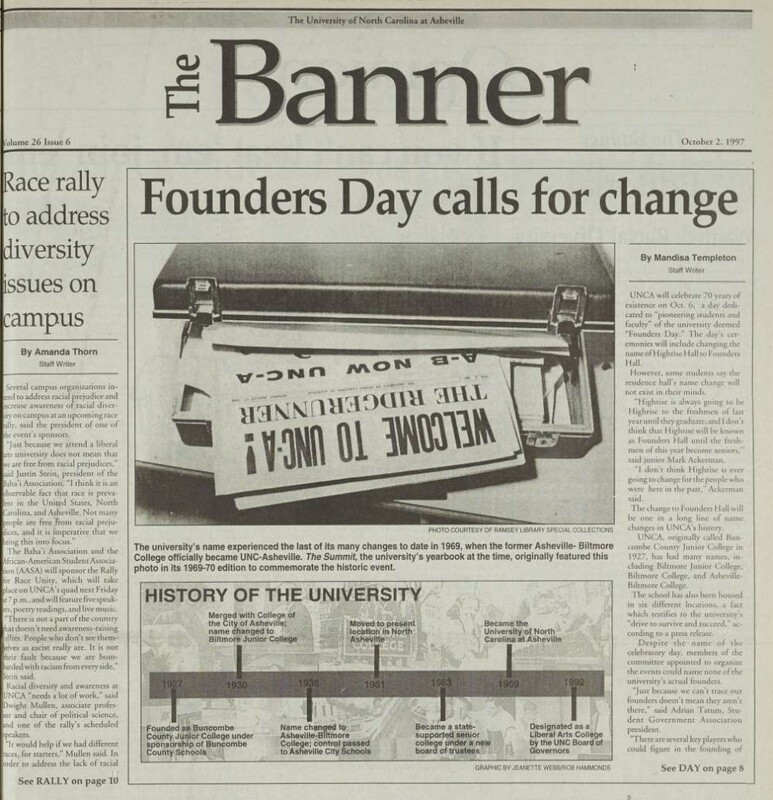 The October 2, 1997 issue pictured to the right documents the school’s first Founders Day, which is still celebrated each September. You can view student newspapers as well as yearbooks from the University of North Carolina at Asheville on DigitalNC. 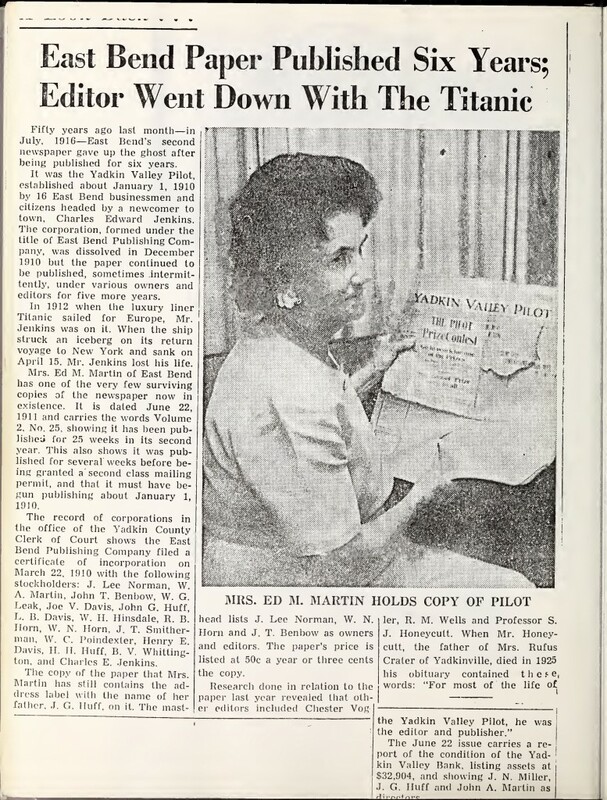 In 1954, in the interest of maintaining communication as their workplace grew beyond a single building, staff at Duke University Hospital began a newspaper. Christened the InterCom through a name-picking contest, the paper would go on to document hospital staff, expansion, research, and events. Issues of the InterCom through 1978 are now shared on DigitalNC by the Duke University Medical Center Archives. 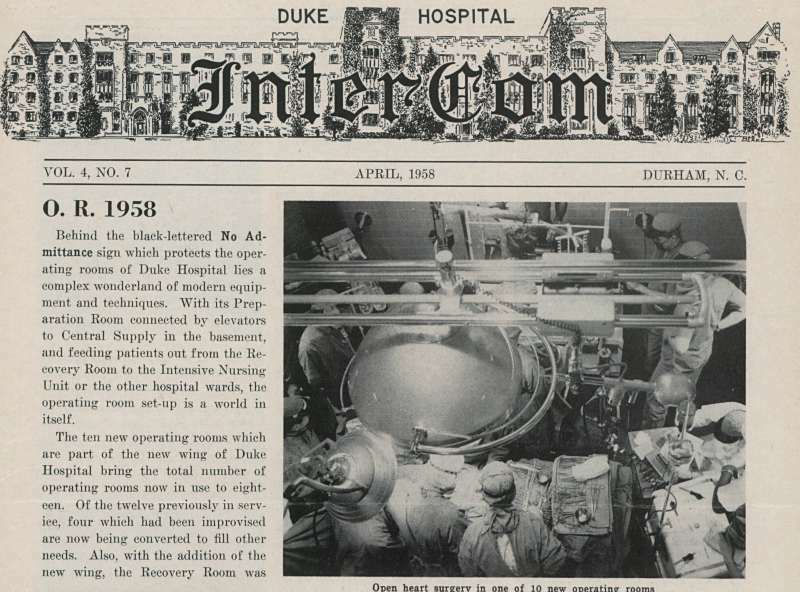 The April 1958 issue of the InterCom reports on 10 new operating rooms in the new wing of Duke Hospital. The earliest issues of the InterCom include personal news about hospital staff as well as information about new technology and the expanding campus. The paper was also an early way to share hospital statistics and successes; there are even thank you letters from patients. As the Hospital expanded to a Medical Center, later issues move away from personal news and focus more on professional accomplishments of individual staff members, while still including useful news and research for those in the field. You can view all issues of the InterCom, as well as yearbooks from the Duke University School of Medicine, on DigitalNC. Issues of Gardner-Webb University’s student newspaper dating from 1942-2011 are now online at DigitalNC. The paper, published continuously throughout that time as The Pilot, covers everything from famous speakers to the development of the campus. There is also, of course, plenty of commentary by students about exams, politics, and student life in general. 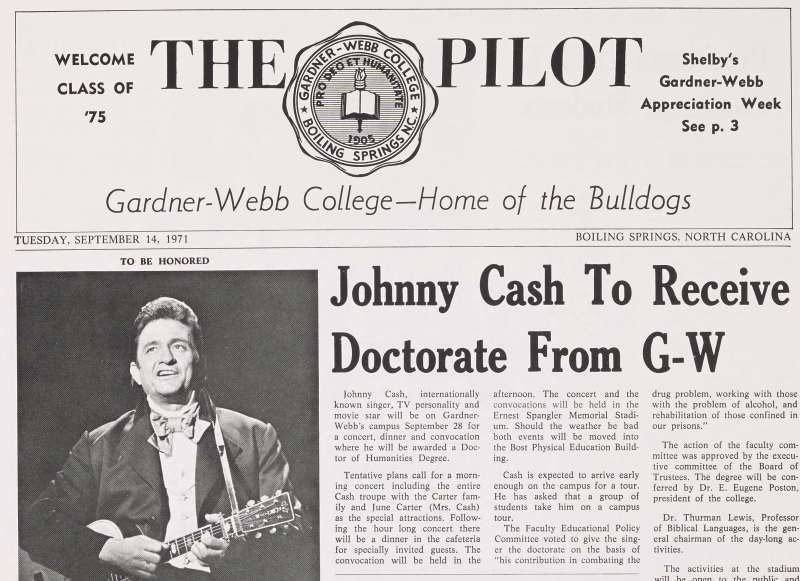 While working on this paper, we learned that Gardner-Webb University (then Gardner-Webb College) awarded an honorary doctorate to Johnny Cash in September 1971. The October 1971 issue of The Pilot describes “Johnny Cash Day,” which included an hour-long concert and an award ceremony at the stadium. Cash as well as his wife and 18-month old son were present for the festivities. We found a number of images of the occasion in the Hugh Morton Collection of Photographs and Films (North Carolina Collection Photographic Archives, Wilson Library, University of North Carolina at Chapel Hill). We’re pleased to have worked with Gardner-Webb to include these newspapers on DigitalNC, where you can view the entire run of The Pilot as well as the school’s yearbooks and catalogs. Location: UNC Charlotte Center City Campus, 320 E. 9th St.
“Digital Charlotte” will feature a talk by Julie Davis, Project Director, Digital Loray, and Public Historian in Residence at the Loray Mill, who will speak about the role of public history in the redevelopment of the Loray Mill in Gastonia. The talk will be followed by a reception during which guests can see demonstrations of digital projects from local libraries including UNC-Charlotte, the Charlotte Mecklenburg Library, Johnson C. Smith University, and Davidson College. This will be a terrific opportunity for local genealogists and history buffs to learn more about the rapidly-growing number of online resources devoted to local history. We are also encouraging Charlotte-area librarians, archivists, and students to attend and participate. This event is being held as part of our work on a recent grant from the Digital Public Library of America. The grant funding has enabled us to expand our services for libraries, archives, and museums around the state. 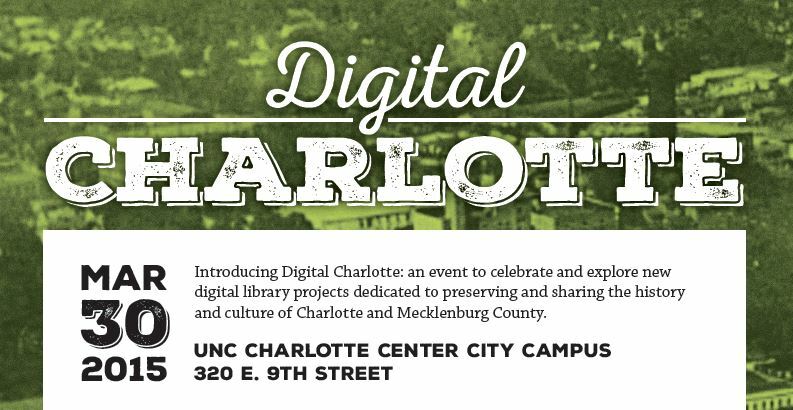 The DPLA is the primary sponsor of the Digital Charlotte event. Additional support is being provided by the Olde Mecklenburg Brewery. Please contact us if you have any questions. We hope to see many of you in Charlotte!